The House of White, also known as the Weis House, was built in 1839 by Joseph Weis, Sr., making it the oldest brick house in Newburgh. The timbers were not hewn but were cut the proper length and put together with wooden pins. The rafters are the trunks of small trees with branches and twigs still on them. The joists are larger trees hewn on one side to lie flat for the floor because at the time there were no saw mills in the area. Bricks were brought down the river on flat boats. During the early years it had floors of packed earth. Joseph Weis, Sr., was a saddle and harness maker by trade and his shop in the rear of the grounds was one of the earliest in Newburgh. Here he trained his son, Henry, who was to follow in his footsteps and open his own shop on State Street in 1869. The Weis family were devout Catholics but the nearest church was in Evansville. Since they were unable to make this trip every Sunday, they and fourteen other families gathered in the front room where Father Kutassi conducted the first Mass offered in Newburgh. Later Mr. Weis helped build St. John the Baptist Catholic Church directly across the street from his home (later this building became the Newburgh Country Store). One of his grandchildren, Joseph Young, left Newburgh to make a name for himself. Known as one of the world’s foremost “soft shoe” dancers, he danced before the crowned heads of Europe. 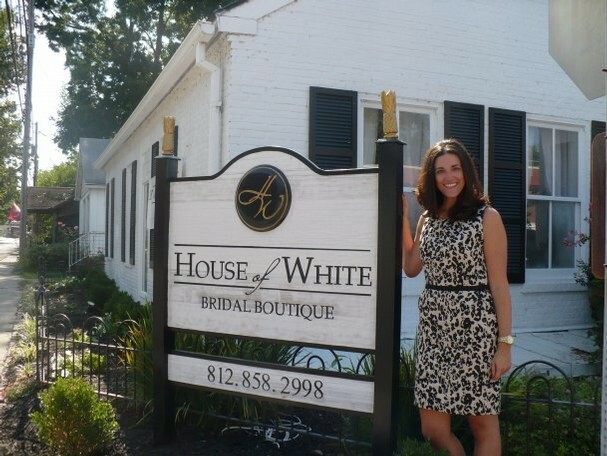 The structure was purchased by Andrea Whitehead in March 2012 as home to the House of White Bridal Boutique. Whitehead is a graduate of Indiana University and the International Academy of Design in Toronto, and spent several years working for luxury couture and eco-friendly bridal designers in Canada. The boutique she founded in downtown Newburgh is now considered one of the nation’s best for wedding dresses.